Two started from Chichester Cross on a cold but occasionally sunny morning, Phil and Mary on their tandem. We climbed Pillygreen Hill and passed through East Dean and Upwaltham to descend Duncton Hill, turning right along the road to Sutton, then Bignor. In West Burton we went left to pick up the Fittleworth road, eventually turning back to the right to cross the A29 then Greatham Bridge eventually arriving at the RSPB Visitor Centre at Wiggonholt. The Walberton Pond Group had just arrived at Wiggenholt, Harvie, Alan and Liz, and big Steve. We refuelled then Harvie led us on to the Rising Sun at Nutbourne. A large Arun-Adur group, about a dozen riders, were already at the pub and we spent a pleasant lunchtime socialising. Colin also arrived and joined us for the ride back. We returned along Phil & Mary's outward route to West Burton and then headed to the tearooms at Bury where a large pot of tea was provided for the group. We then crossed to the Houghton Bridge road and climbed Houghton Hill, descending and ascending back to the Spur where we split up. Phil & Mary headed back via Eastergate and the rest headed for the coast. Thursday 2nd March, off the beaten track. Weather today was bright and sunny with a northerly wind and temperatures getting to 20C. During the day despite being here for over 7 weeks now I was able to find 2 quiet backroads I had not tried before. The ride was over to the NW coast near La Santa. I rode up to the central plateau on backroads to Tias and then Conil. Just before Conil I turned off on the first untried route over to La Asomada. The route wound its way parallel to the coast 900ft below. Just before La Asomada there was a short steep climb at about 17%. 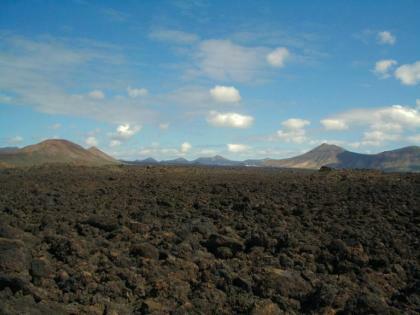 I continued north to cross the lava plain and then start down the other side via Tinajo. I then turned off on the second untried route via El Chuchillo and then on a cross country route seriously off the beaten track. This ran parallel to the coast and about 300ft above La Santa. The road was tarmac but broken up in places. Traffic was an average of a car in 15 minutes. I returned via Soo and Tiagua with a welcome tail wind for the climb. 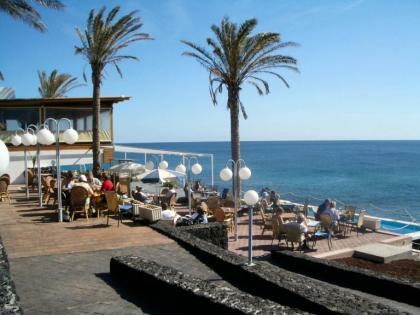 Then on to San Bartolome and down to Playa Honda for a late lunch at a restaurant on the prom. 41 miles for the day with 2300ft of climbing. Weather today was cloudy in the morning clearing later in the afternoon. Winds were light northerly and temperatures reached 19C. I rode a short circuit first taking a backroad up to Tias at 700ft and then another backroad to Masdache on the central plateau climbing another 400ft to 1100ft. Then across the volcanic plateau to La Vegueta. 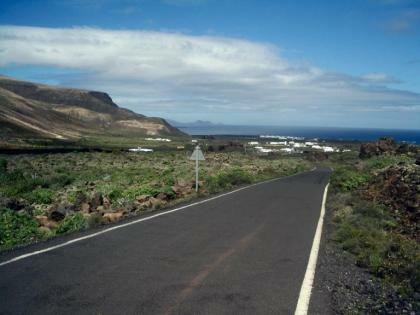 Then SE via Mancha Blanca to Timanfaya National park and a bit more climbing past the Volcanoes. Then a long descent across more lava fields to Yaiza and then back down to the coast and base. 32 miles for the day and 1800ft of climbing. 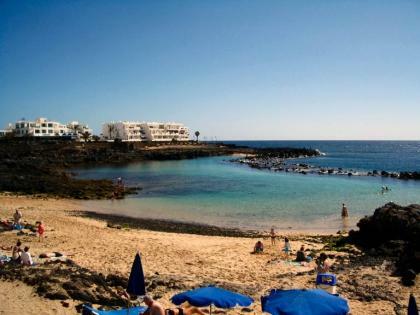 Lanzarote, Saturday 25 and Sunday 26 February. Saturday 25 February, Orzola Ride. More cloud than of late today but with some good sunny spells. A strong wind from the SW kept temperatures high at 21C. I decided on a long hard ride to the north. I headed out via Tias, San Bartolome and Teguise with a stop for a break in the square. Then up the big Haria Pass climb to 2000ft and down the hairpins to Haria at 1000ft. Then further north on a loop via the village of Ye. I started down the descent towards Arietta but then turned off on a narrow backroad for Orzola on the coast in the far north of the Island. This was the first time on this road for this trip. The road wound its way down towards the coast across jumbled rocks of an old lava field partly broken up by struggling vegetation. 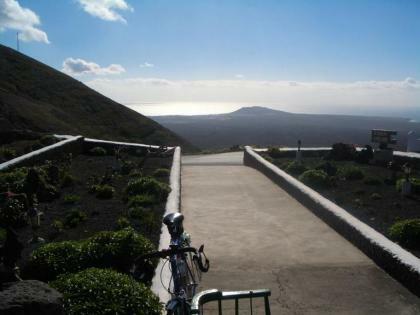 High above the road was the broken rim of the volcano which created the landscape. At Orzola I bought food at a Supermarket and had a picnic lunch at the port. Then back on the coast road via Tahiche with a hard ride into the wind all the way. 66 miles for the day and 4800ft of climbing. For the week ending today 236 miles. Bright and sunny all day today with scattered white cloud. A brisk westerly wind and temperatures up to 23C. I decided on an easier ride today with a visit to the Costa Teguise beach but with a few mountains thrown in. I first climbed up to Tias on the main road, and then a backroad up to 1100ft to the plateau main road at Masdache. 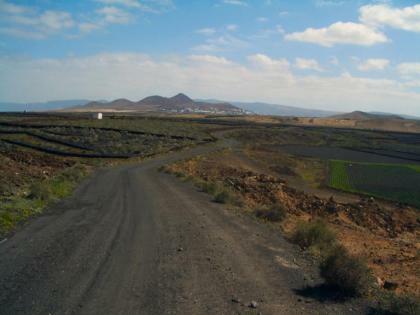 Then north towards Teguise but turning off on a backroad to Nazaret and then down the main road a short way to Tahiche. 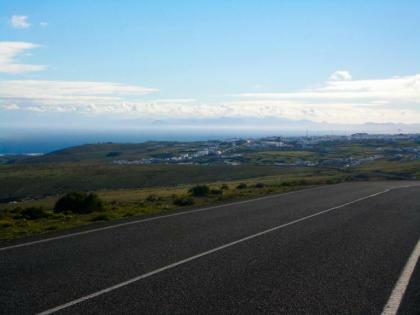 There I turned off on the old coast road and turning off that after a few miles to descend on the back road to Costa Teguise. 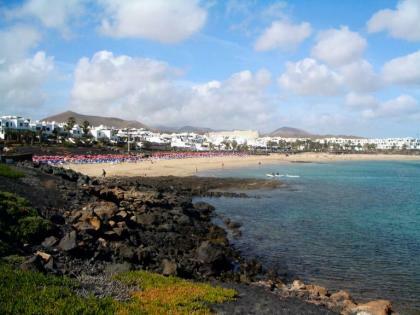 I made my way down to Playa Cucharadas the main beach for the northern part of Costa Teguise. I had a leisurely lunch at a restaurant fronting onto the prom and then a couple of hours sunbathing on the sandy beach. 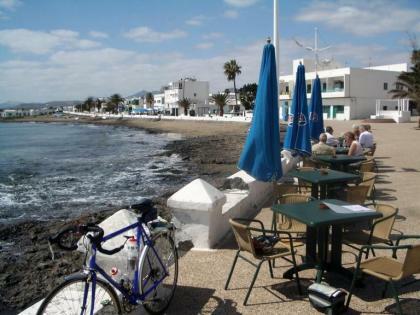 I rode back on the prom/cyclepath and then into Arrecife. Sunday afternoon is an ideal time to ride through the capital with hardly any cars around. 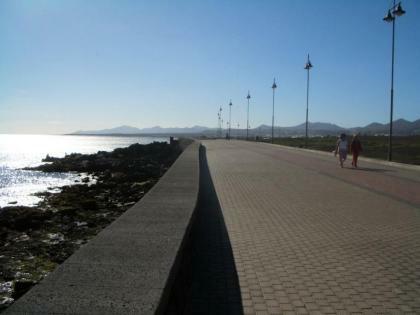 Then the prom/cyclepath back via Playa Honda. 39 miles for the day with 1500ft of climbing.